History may have been my easiest subject in school. I love studying history. But Science captivates me. I love learning about plants and animals and what makes them what they are almost as much as I love learning about people and places and events. The intricacies of living things are incredibly fascinating. Nature is my place of refuge. I want to understand my world and what makes it works, at least a little bit, so that I will never cease to appreciate what God does around me ever day to sustain life. It Couldn’t Just Happen is actually a book for children, but I had fun reading it in the mornings in my car while I waited for work. I enjoyed the simple illustrations and review questions at the end of each chapter. It was definitely not written to entertain, but geared more towards education and yet it really was very interesting, unlike some of the dry science books of my past! Mr. Richards had a good way of explaining things at a level that an 8-12 year old would understand and enjoy. I couldn’t help but think how good this would be as a supplement to the homeschooling program that I hope I will get a chance to create and teach one day. The colored pictures and illustrations helped to make the words come more alive and the questions would be a great way to make sure that your child is focusing and understanding what is being read. The fun part is that there are little, fun assignments sometimes to make what you read a personal experience and not just another bunch of words. 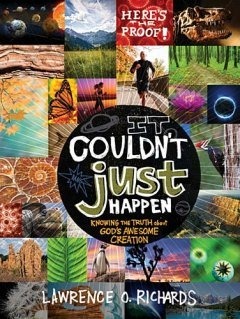 I’m thinking that this will make a good addition to my resource shelf, and hopefully I’ll have a chance to share and to use some of the contents of this book to inspire some other young heart with a love for Creation and understanding the wonderful way that God made this world work. thanks to booksneeze for allowing me to review this copy for free. the opinions expressed are my own. Sounds like a great teaching book as well as keeping your attention well. I like science books like that! !